So you’ve achieved diversity. Now what? 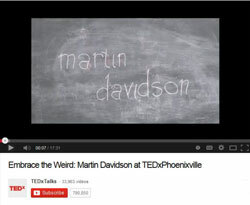 If you’ve ever asked yourself that question, Martin Davidson has a few ideas to share with you. Though he advocates diversity, Davidson believes mere numbers mean nothing. He values inclusion, but not for its own sake. His solution? Abandon the often burdensome notion of diversity efforts and embrace a new concept: leveraging difference. Diversity is capital. Invest it wisely and watch it grow. Stay current on when and where Martin will be speaking: facilitating conference sessions, teaching custom executive education courses, speaking as a featured keynote, and as the subject of media interviews. Read articles on the subject of diversity in news and industry publications where Martin is featured, quoted, and referenced. Listen to the 17-minute broadcast at The Broad Experience, a conversation about men discussing women in the workplace…without women in the room.